Died: Jan 17, 1997 (at age 90) in Las Cruces, New Mexico, U.S.
Pluto used to be the ninth plant in the solar system until it was demoted to a dwarf planet several years ago. Its demotion happened less than a decade after the death of its discoverer, Clyde Tombaugh, who died in 1997. Tombaugh discovered the small, rocky, frigid planet while he was studying photographic plates with a blink microscope at the Lowell Observatory in 1930. It was just where Percival Lowell had predicted it would be some 15 years earlier. Born in Streator, Illinois, Tombaugh and his family moved to Burdette, Kansas, when he was still young. Unable to go to college because he was needed on his family’s farm, Tombaugh was largely self-taught. When he was still young, he began to build his own telescopes and was hired to work at the Lowell Observatory in Flagstaff, Arizona, which was and still is run by members of the Lowell family. He stayed at the Observatory from 1929 to 1945. During his time there, Tombaugh attended the University of Kansas. He worked at the observatory during his summer breaks. At Lowell Observatory, Tombaugh was given the job of actively searching for Pluto. He used a 13-inch astrograph, which is a telescope that takes pictures of the stars. The blink microscope helped him tell the different images apart and compare them. A moving object would change position while the stars remained motionless. 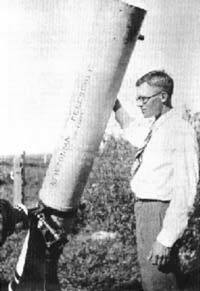 Though he eventually discovered Pluto this way on February 18, 1930, Tombaugh found many asteroids in the meantime. The first one he found he named after his daughter, Annette. He was fond of naming asteroids after members of his family. Besides the hundreds of asteroids Tombaugh discovered, he also discovered variable stars, which change in brightness over time. He also found clusters of stars and galaxies and at least one supercluster of galaxies. He also claimed to have seen UFOs in New Mexico. Though he prided himself on his scientific objectivity, he could not rule out the possibility that these UFOs had an extraterrestrial origin. He became part of a project that searched for near-earth satellites, but claimed that the search, in the end, was unsuccessful. Though he discovered it, Tombaugh actually did not name the planet Pluto. Before it was discovered it was given the placeholder name of Planet X. The name Pluto was suggested by an 11-year-old English girl named Venetia Burney. The name fit because Pluto is the name of the Roman god who rules the underworld. The name was also a tribute to Percival Lowell’s initials. The name became official on the May 1, 1930. Tombaugh’s wife Patricia claimed he would have been disappointed by Pluto’s demotion, but would have accepted it eventually. Tombaugh died in Las Cruces, New Mexico, on January 17, 1997. He was 90 years old. But this is not the end of his story. He was cremated and a container holding some of his ashes is in the New Horizons spacecraft, which was launched on January 19, 2006, with the goal of surveying Pluto and five of its moons. The spacecraft is supposed to reach the Pluto system around July 14, 2015.